Two men, Ajayi Tosin and Kesiena Tito are presently in contention over ownership of a five-month-old baby, Emmanuel Omkhode Ajayi in Warri, Delta State. The duo are laying claim to the child delivered by an eighteen-year-old girl. The matter deepened after Ajayi was allegedly arrested over the weekend following a petition of “Threat to Life” instituted by Kesiena to the Nigeria Police Area Command. In an exclusive Chat with Daily Post, Tosin Ajayi, a twenty three year old barber claimed to have cohabited with Blessing Iroroteh since 2015 before she delivered a bouncing boy this year, 2017 in his house. Ajayi also claimed that his elder sister was responsible for the medical bills after Blessing was delivered of the baby, delivered. 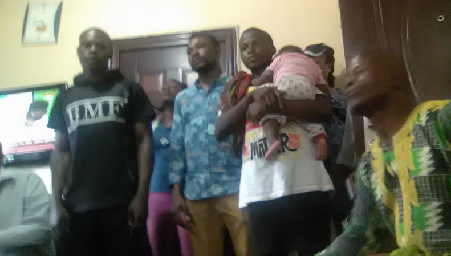 He stressed that he has been catering for her and the baby, including her mother who came to nurse (Omugo) the baby for two months in his house at Nnewi Street, Akah Avenue in Effurun, Uvwie Local Government Area of Delta State. Ajayi noted that he did the naming as well as dedication ceremony in the presence of her mother who later whisked her (Blessing) away to the home of Kesiena Tito as the owner of the baby. Ajayi alleged that he was forced to say that he was not the father of the baby at the Police Station by Kesiena’s family. He added that he was even forced to take N100,000, sign an undertaking to forfeit the child by the Kesiena’s family stressing that, “they even said I should swear affidavit” but I rejected it. In a contrary view, Kesiena Tito claimed to have dated Blessing, mother of the contending baby boy for five years pointing out that they separated ten months ago over an unresolved issue before she was delivered of the baby at Ajayi’s house. Kesiena who hails from Ophorigbala Community, Ughelli South Local Government Area stated that he has been responsible for education of Blessing all these years. Blessing Iroroteh stated that she left Kesiena’s house to Ajayi’s house because she felt he (Kesiena)will not accept the pregnancy and the baby. Blessing also stated that her mother was aware that the child does not belong to Ajayi but she came there to do “Omugo” and partook in the dedication. Daily Post gathered, however, that the Police at the Area Command in Warri has ordered that DNA be carried out to ascertain the true owner of the child or that the matter be referred to court.